Two-lined salamander are small sized, reaching 8.5 cm with the tail counting for half of this size and has every members of it’s family, the plethodontidae they are lungless and relates on their skin for breathing. 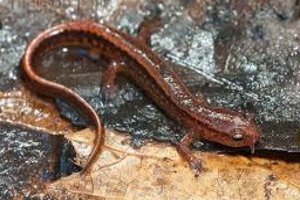 The Two-lined salamander is known in Canada has the Brook Salamander because of their preference for running water habitats and some have been found in lakes in shallow waters. They can be observed near water source when the environment is very humid. This salamander distribution include central and eastern Ontario, southern Quebec, New Brunswick. The two-lined salamander range is continuous from the great lakes to the Atlantic coast. The two-lined salamander coloration is most commonly yellow, but can also be brown or orange. Two-lined Salamanders also have 2 lines that break up into spots on the tail. They sometimes show black marks on it’s site that can be hard to see depending on the importance of this caracter..